SpaceX will launch a used Dragon cargo ship on a pre-flown Falcon 9 rocket booster from Cape Canaveral Air Force Station in Florida Friday, Dec. 15, 2017, to deliver NASA cargo to the International Space Station. After several delays, SpaceX will launch a cargo mission to the International Space Station today (Dec. 15) in what will be another leap forward in the private company's push toward full rocket reusability. With a pre-flown Dragon cargo spacecraft launching on a used Falcon 9 booster, this mission will reuse the most spacecraft parts of any SpaceX mission to date, and you can watch the launch live online. The Falcon 9 rocket will lift off from Cape Canaveral Air Force Station in Florida at 10:36 a.m. EST (1536 GMT). You can watch the launch live here, courtesy of NASA, beginning at 10 a.m. EST (1500 GMT). A post-launch press conference by NASA and SpaceX will follow after the launch. The Dragon cargo delivery mission has been on hold since last week, when SpaceX delayed it from a Sept. 8 launch target to allow more time for systems checks. The need for systems checks delayed the flight from a Dec. 12 liftoff, with SpaceX calling off a Dec. 13 attempt in order to clean and test ground systems after finding particles in the Falcon 9 second stage fuel system. NASA has contracted SpaceX to fly cargo to the ISS on its Dragon cargo vessels, and this will be the 13th of 20 flights planned under the cargo resupply services contract. Known as CRS-13, this mission will deliver 4,800 lbs. (2,180 kilograms) of crew supplies and scientific payloads. Among the experiments is a machine designed to make optical fiber in space. 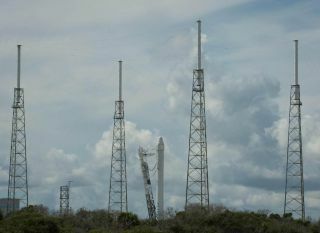 Today's launch will be the second for both this particular Falcon 9 and Dragon spacecraft. The Dragon cargo capsule flew to the ISS in April 2015 for the CRS-6 mission and splashed down in the Pacific Ocean five weeks later. This Falcon 9 rocket launched with another pre-flown Dragon for the CRS-11 mission in June 2017, with the rocket's first stage returning to Earth for an upright landing a few minutes later. Following the launch, the Falcon 9 will return for its second landing attempt at Cape Canaveral's Landing Zone 1. The Dragon will begin a two-day orbital chase of the ISS, where it is scheduled to arrive on Sunday (Dec. 17). Astronauts will use the Canadarm2 robotic arm to grapple the incoming spacecraft at about 6 a.m. EST (1100 GMT). Space.com will also provide live coverage of the Dragon's arrival, capture and installation beginning at 4:30 a.m. EST (0930 GMT), courtesy of NASA TV. Visit Space.com for complete coverage of the SpaceX cargo launch. Editor's note: This story, originally posted Dec. 11, has been updated to reflect SpaceX's launch delays.